Clifton, Arizona. $20 1882 Value Back. Fr. 584. The First NB. Charter #5821. PCGS Currency Very Fine 30.Any collector who has ever tried to put together a state collection of 1882 Value Backs will know the name Clifton well. 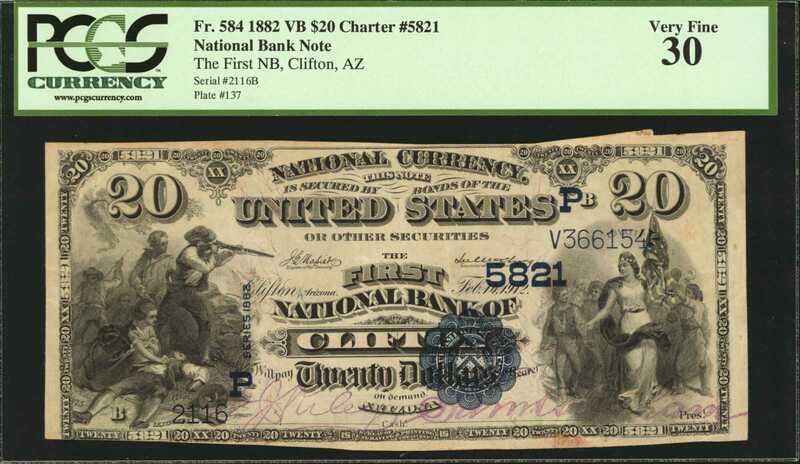 Tempe and Clifton, both one bank towns, are the only institutions in Arizona that issued 1882 Value Backs. None are reported from Tempe, and just a half dozen are documented from Clifton. Of the six known survivors, the one we are auctioning tonight could be the highest grade. The rarity is important, but the bright paper and bold purple signatures are the selling points. Whether you need this for the type or for the town, consider this one carefully. This is an opportunity, the next offering will likely be a compromise.